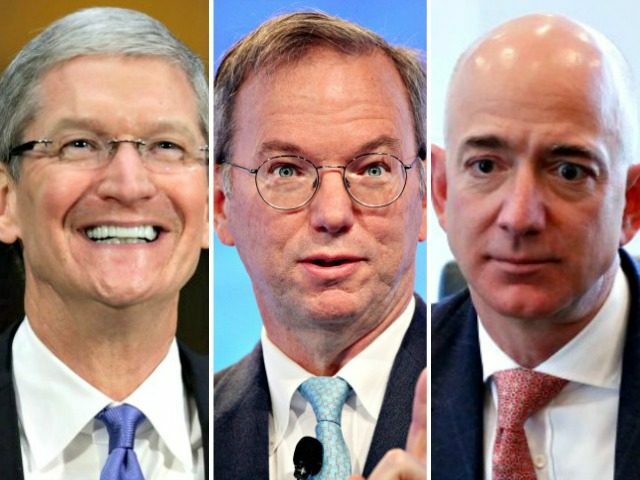 Some of the top CEO’s of technology companies in America met with Donald Trump at the White House on Monday, praising him for hosting an afternoon summit on important tech issues. “I’m absolutely convinced that during your administration there is going to be a huge explosion of new opportunities because of the platforms that are getting built in our industry,” Schmidt said to Trump after the meeting, as over a dozen CEOs went around the table to make comments after the meeting. Schmidt said that the combination of entrepreneurs, skilled workers, and immigration would provide “huge” growth in the American economy. “It’s going to happen soon during your leadership,” he predicted. Apple CEO Tim Cook said he was pleased that Trump’s son-in-law Jared Kushner and his daughter Ivanka Trump were bringing technology companies together in the Trump administration to help streamline government. “The U.S. should have the most modern government in the world, and today it doesn’t,” he said, predicting that the tech innovations made in the Trump administration would pay back immensely in the future. Cook also offered advice to Trump, suggesting that the federal government needs to be more focused on the people, which was not how it currently operated. “The government should be focused on its citizens, and the services of the government should be measured on how pleased the citizens are with receiving its services,” he said. Cook also told Trump that computer coding should be “a requirement” for public schools. “We have a huge deficit in the skills that we need today, vs. the skills that are there,” he said. He advised Trump to use more commercial technologies in government to save taxpayers money. “I think you guys are already headed that way,” he said, adding that he wanted to see more worker re-training and tech skill development. He also urged more awareness of artificial intelligence. Microsoft CEO Satya Nadella also thanked Trump for the opportunity and said he hoped that Trump would continue both government spending on technology and “enlightened immigration” policies that would allow them to stay competitive. Over a dozen tech CEOs attended the meeting and appeared optimistic about what was possible during this administration. Trump appeared open to working with them on issues they cared about, including immigration. “[W]e’re working very diligently with everybody, including Congress, on immigration so that you can get the people you want in your companies,” he said. Peter Thiel — the most high profile venture capitalist in Silicon Valley, who endorsed Trump — praised the president for highlighting the importance of technology. “It’s an important job and as you can imagine, there’s a lot of folks out there doing a lot of bad things,” he replied.